I've been fighting the urge to snag another one after losing the first down the Storage Room Whirlpool, but a very nice young man came knocking on my door with a flaky SE/X/30 in hand . . . it must be fate. 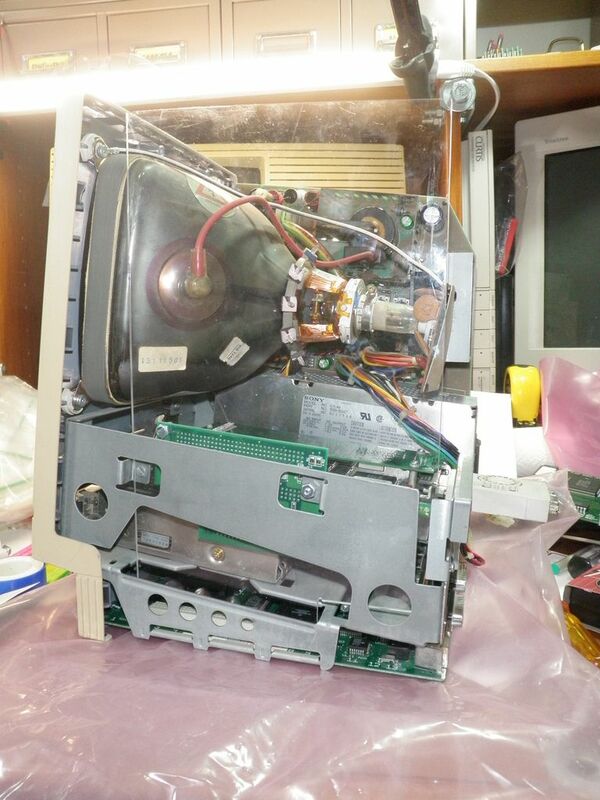 As chance would have it, I blew up the IIsi testing a 12" RGB from a craigslist lot I picked for Snake88. 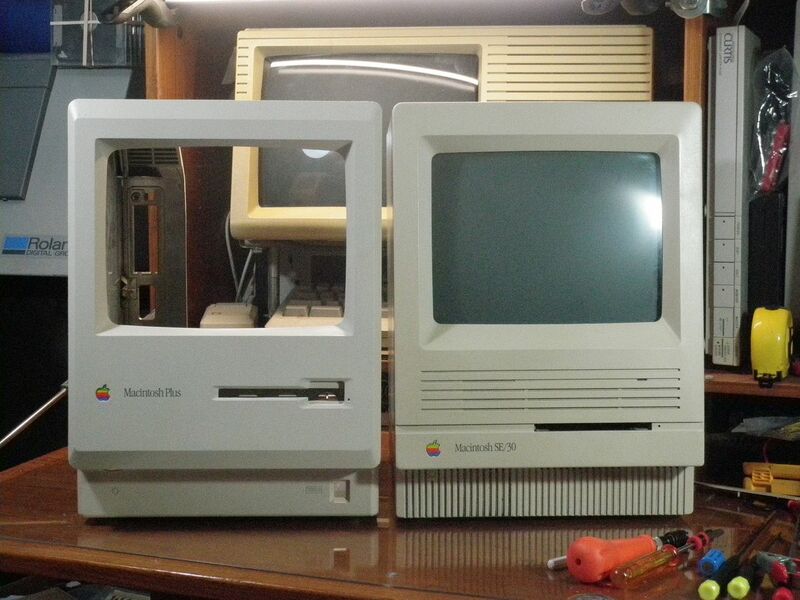 He got the lion's share of that along with a pair of Apple monitors and a flaky Performa 475 from my hoard. I've been meaning to get around to doing the DuoNuBusMiniDock™ portion of the DuoBoomBoxDock™ hack dating from my earliest days over on 'fritter. At any rate, I decided that I might as well go for two slots and stick the more traditional IIsi/X/30 PDS connector on the other end of the board. It's not the project I planned on doing, but it's the one that has fallen into my grubby little paws when they were precipitously idled. *** Who said anything about putting the bucket back on the thing anyway? Still got that plexi-plus bucket? Absolutely! It's not a bucket though, it's a side panel that fits inside the bucket, which is much better for my purposes. Thanks for reminding me, great idea! I think I'll make a simplified version for the wire wrap prototype though. Bending a piece of plexi so it provides a bottom plate to protect the solder side of the MoBo and and brings the Project30 fit testing unit up to its proper parallel to the floor ange will work nicely. With leftover galvanized sheet metal and the new bender I can add a grounded static discharge protection inner floorpan and use leftover sign vinyl for insulation inside that. I don't need the second side panel because this hack leaves the A/B and its insulation cover intact. This is without doubt a collaborative venture, I can't pull it off on my own, which is why I posted it at such an early stage. Thanks for being the first collaborator with your reminder/suggestion!. I chose the cards to have three functions in two Slot Manager IDs. 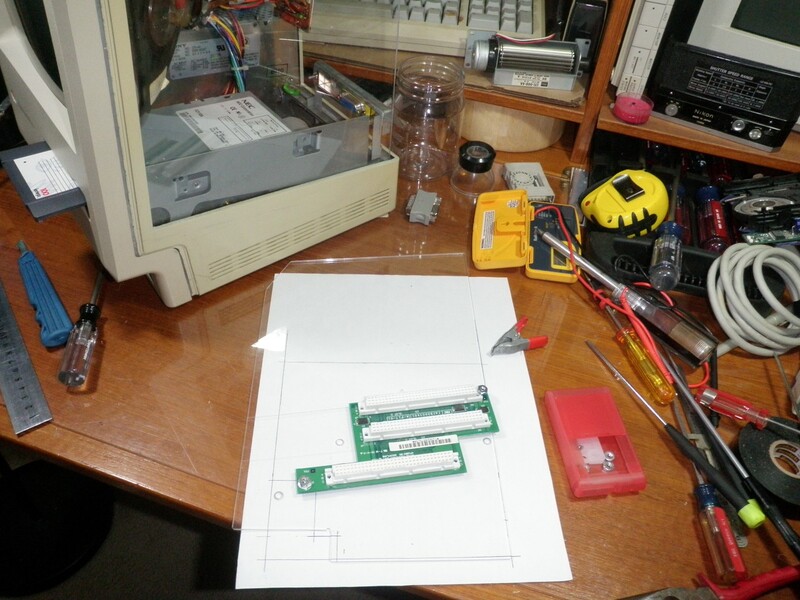 IIRC I can cut and jumper the interrupt lines on the Gemini Twin Slot Adapter to match its NuBus Slot ID assignments per bbraun's suggestion in the Gemini card expansion hack for the NuBus Adapter in the recently scuttled SuperIIsi™ project. I'm guessing that a PowerCache Accelerator requires one of the three(?) available interrupts of the X/30, would that be correct? Radius Pivot NuBus hacked and bolted up to Radius Pivot breakout plane of unknown SE or SE/30 origin. 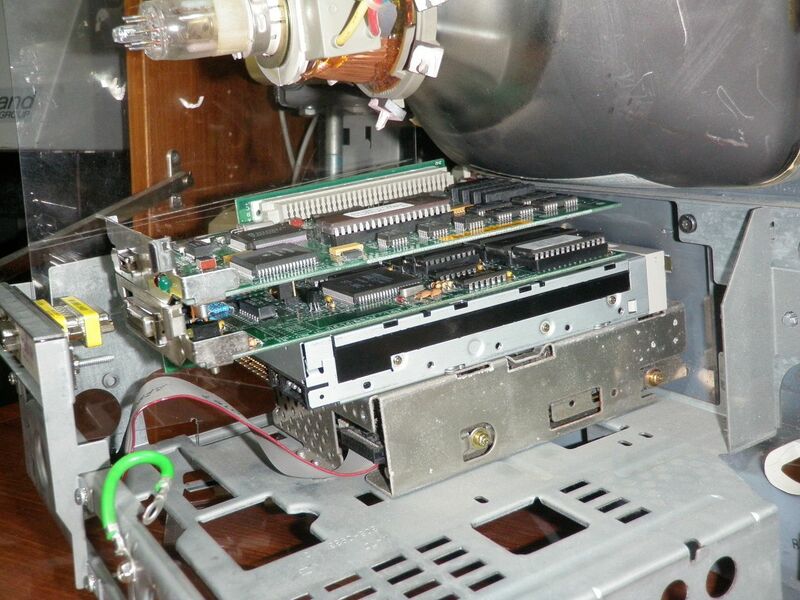 Note cubic for 2.5" UltraSCSI SCA Server Drive atop FDD cage. X/30 NIC and its passthru connector won't work out as originally conceived . . . what else is new? Shifting the NuBus Cards up a notch smooths out a couple of physical limitations, restoring the cubic above the FDD cage would be one. There's no need to shove the cards up into the expansion bay opening, an integrated VGA Adapter goes a deep way for that cabling issue. Patching the 10/100bT connector to the missing panel is no biggie, snaking a Cat-5 cable through the bucket upon installation will be even better! These shots show the clearances and a couple of angles of the interboard connection plan. I had a row of the machine pin hack on the un-bobbed Gemini adapter. 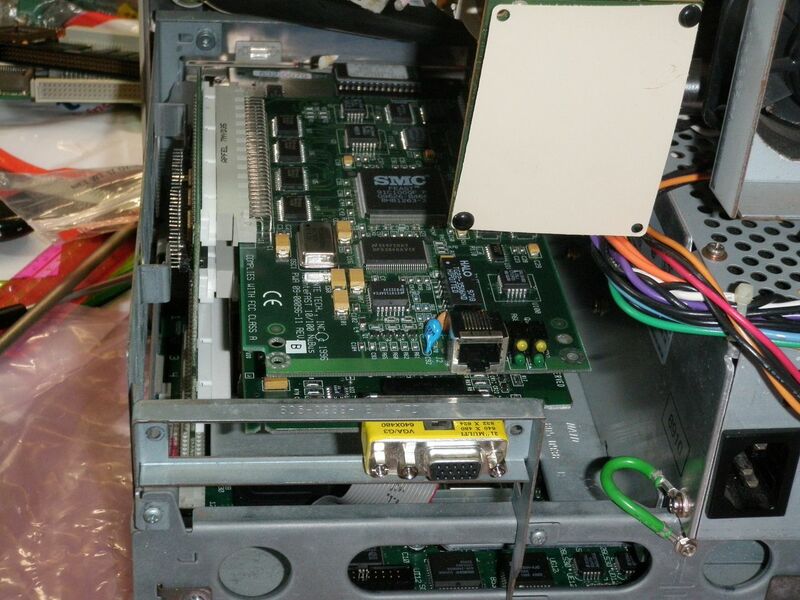 Repositioning the slots makes for better clearances overall and socketing of the the interboard connection so I can bolt the main expansion card up to the unmolested sheet metal of the X/30 and then bolt the modified Gemini card to the NuBus Transceiver Chipset expansion card. If such should prove successful, the show and tell Omega Rev. of the project*** will be back to its 3-Functions-in-2-Slot_IDs configuration. The X/30 can be racked and KVM adapted to the main setup, its display would become superfluous. The handsfull of pixels available on its CRT being but a drop in the bucket of the Radius Thunder IV 1600 (with 4xDSP support) to be installed behind that nice, short, pretty yellow 1600x1200_VGA adapter. The Asante 10/100 NIC . . . maybe . . . if that works out as well? All I need to do at that point would be to source a worthy PowerCache Card to install and design the adaptation for it into this Swiss Army Card. Mere details . . . I finally found my DuoDock(1) boards to compare to the IIsi NuBus adapter and we're lookin' good. 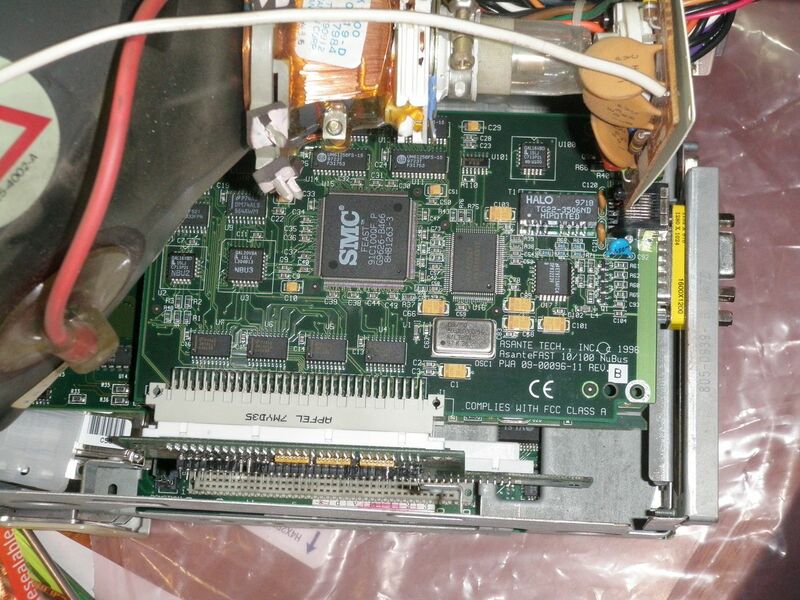 The NuBus Transceiver to Slot termination resistor packs 1-3 are already located on the twin slot card, the transceivers are the same standard TI parts and the silk screen layers on both say NuChip above the controller ASICs without further qualification other than what appears to be a 30-33 (MHz?) qualifier for the Duo part. Same, compatible or not, the DevNotes will likely tell . . .
. . . but there are about 2.4 bazillion tiny little SMT resistors and capacitors involved! Many of those on the IIsi adapter are undoubtedly related to the stock 68882 on the IIsi adapter and the empty socket on the DuoDock LoBo, YAY! Gotta check the old threads, but I know that the NuBus adaptation just works when powered up, the ROMless, lidless, LCD active testing proved that and I'm pretty sure that the FPU des the same thing. Both circuits have the same 40MHz crystal cans with similar capacitor bricks alongside. Termination resistor packs R4-7 on the IIsi adapter are missing on the DuoDock/Adapter combo, so heaven only knows what that means at this point, but probably not required for my adapter. 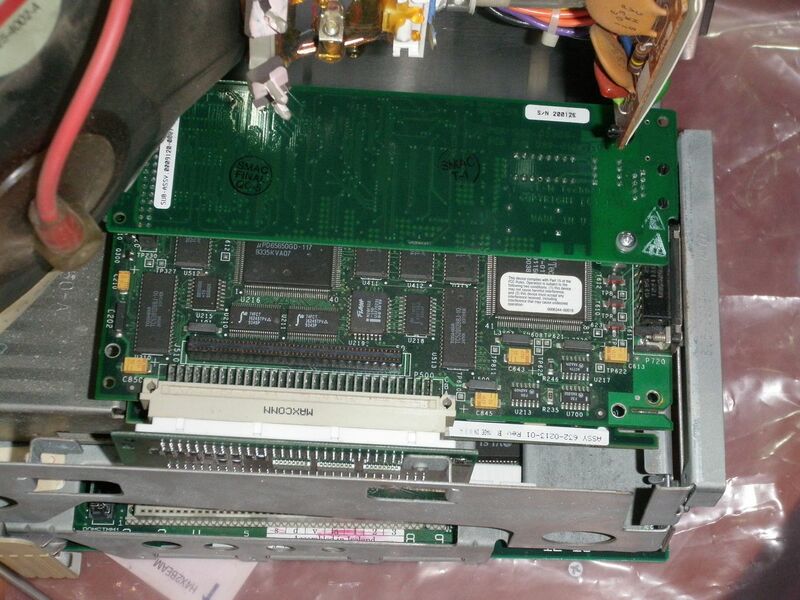 Both adaptations use the same pair of 74ALS240 inverter/bus driver packs. Snatched the SIMMS off the X/30 board and installed a Daystar PowerCache LC3 adapter across the MoBo. Bolting a nice thick of Plexi "T" up to the PCB mounts of the connector and standoff hole on that will let me bolt my clear plexi mock-up of the full board to that and then the Gemini board to that. Research, Plexi Fabrication and reverse engineering/schematic development coming up . . . what's not to like! Physical fit is squared away, Plexi mock up of Expansion Card PCB in place with Gemini Twin Slot Adapter bolted up to it in position. Top side you've seen . . .
. . . bottom side I haven't even seen until now. It's easy enough to raise the Genini Card far enough off the surface of the PCB so that Bus Transceivers, NuChip and many of the tiny components can be positioned underneath it, closer to the bottom of the PDS Adapter than I'd thought. I tried the ZipMacPlus™ front bezel on the X/30's bucket just for kicks and it fit pretty well. Of course a Plus Bucket won't go the other way . . .
. . . 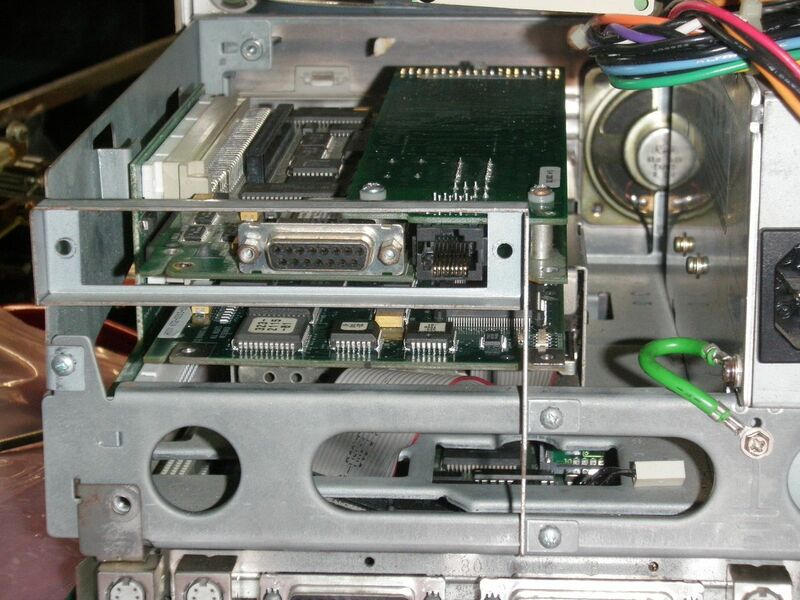 I thought I might be able to install the NuBus Cards underneath the external SCSI Zip Drive I had hacked for the Plus, but there wasn't room. I pulled the X/30 apart to see if there was a blown fuse in the PSU, there was, but it's probably tho only thing that's tested good so far. I jumped right in there because I'd fixed a borked trace on the bottom of the MoBo with no joy at all. Besides, I wanted to see about re-arranging things a bit . . .
. . . 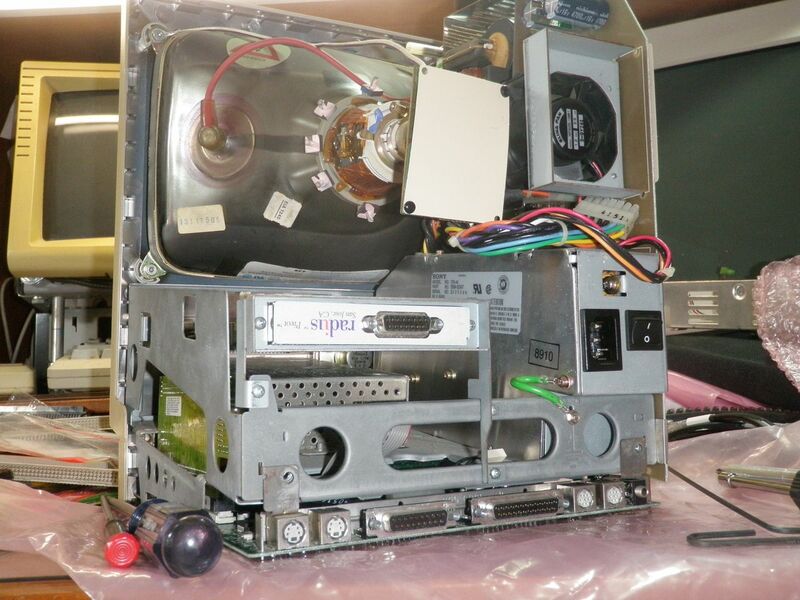 I raised the NuBus Slots as high and tight to the CRT as I could so that the bottom card sits right on top of the Internal Zip Drive, which is fine for now. 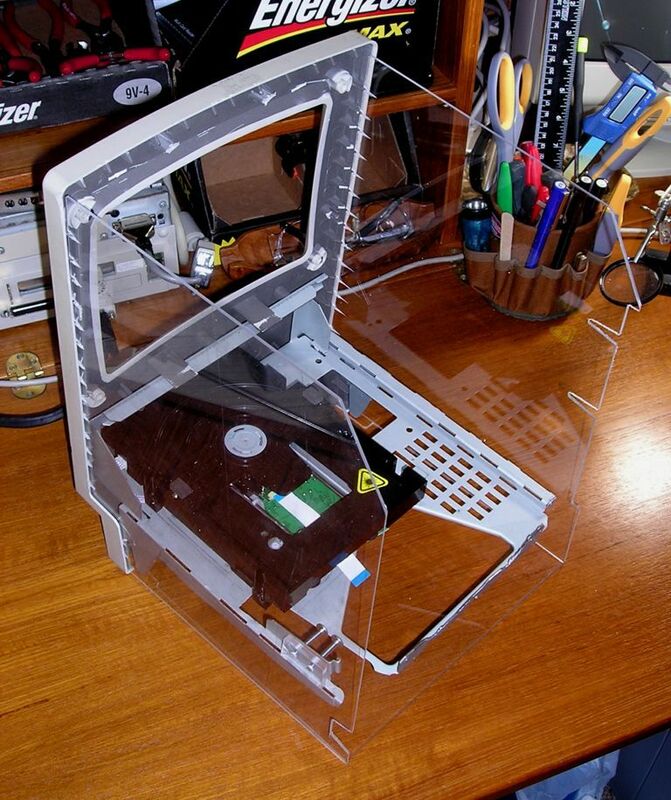 In order for the Zip to mate up with the modified Plus Bezel's' Floppy Slot, I'll have to remove the stock FDD cage (it'd be empty anyway in this config) and install a lower profile HDD cage of some sort. 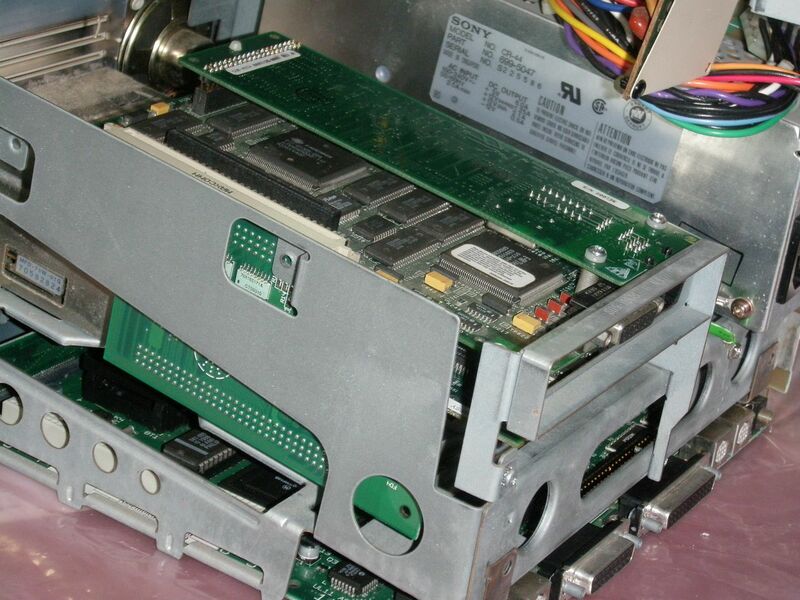 Holding the HDDs, it will place the Zip drive at the appropriate height, which then clears the bottom of the lower NuBus Card. 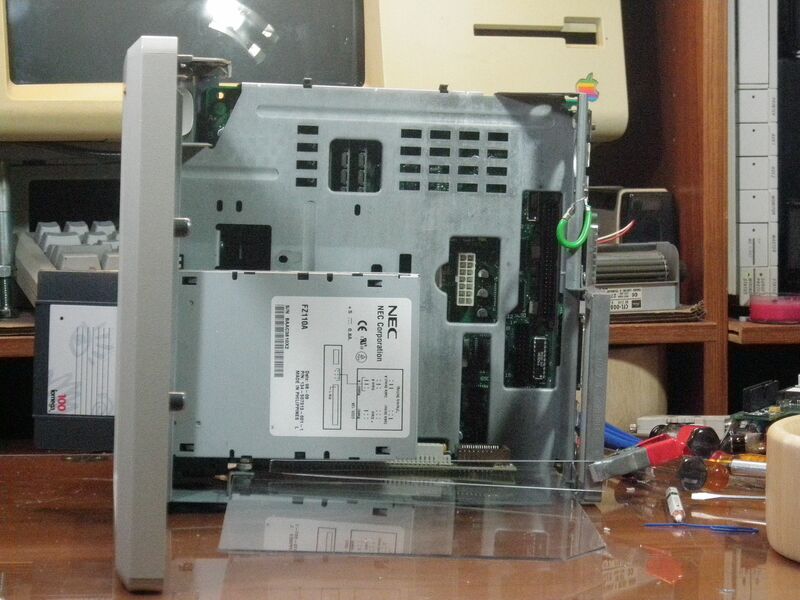 I can move the NuBus slots back away from the CRT a bit for more clearance. I'll still have plenty of room to connect the Video Card to the VGA adapter with ribbon cable and IDC connectors. I figure an RJ-45 connector rotated 90 degrees will fit into the KBD opening just fine for the 10/100bT or vanilla 10bT. Here it is (if all works out favorably) meet the ZipMacPlus/NuBus/30™ for the first time. I know somebody who's just gonna flip at that name! 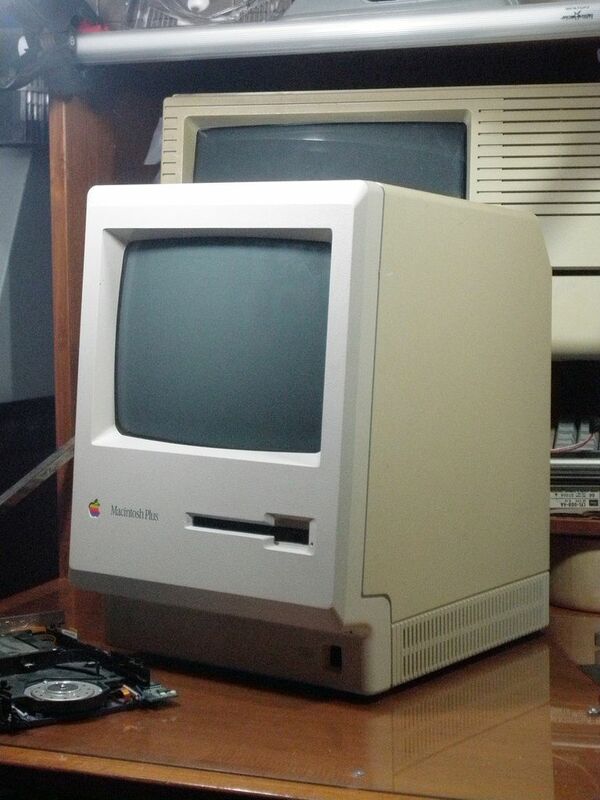 Two hacks in one box works for me, besides, my Drexel 512k is really a Plus with a 16MHz '030 Accelerator. So why shouldn't my extra, beat up old Plus that's already been defa . . . erm . . . had elective surgery, be a hopped up sleeper as well. After all, the Classic has a G3 in it and the X/30's front Bezel clashes badly with the design aesthetic of my displays. I figure I'll run with it, just gotta move the speaker. I've had my head buried in a small pile of books and found out I probably shouldn't try to combine the /30 and NuBusMiniDock projects. Mac II _______ NuChip ________ ? 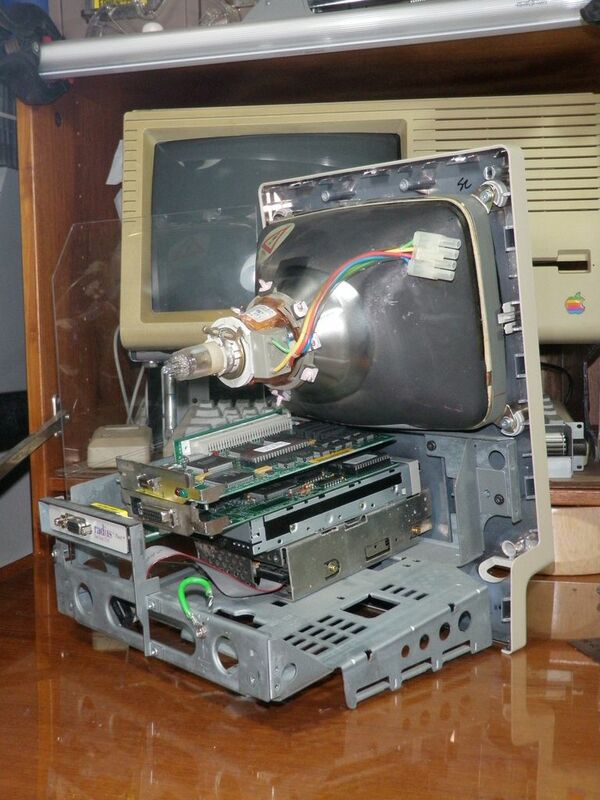 __ Could somebody check this against what I found in the IIcx? Mac IIci _____ NuChip 30 ____ Anybody got a IIci board handy to check for the TI parts below? Later Docks use a FUBAR implementation as far as this project is concerned. Quadras as well, IIRC. I'm thinking that the NuChip 30/TI Parts from the IIsi adapter or same with the NuChip 34 from the Dock1 might still work, but I've got more info available for the NuChip aproach. Since the /30 is almost inevitably described as an AIO'd IIcx, the more conservative NuChip approach seems in order. bbraun, whatchathinkin' from the ROM perspective? My WAG is that if NuChip and a gaggle of 74ALS651s appear on the I/O bus of the /30, Slot Manager will do its thing if the ROM's still got its IIcx roots and it'll "just work" . . .
. . . or not. It all depends upon that missing /NuBus signal I guess. BTW: This one is interesting - http://www.ti.com/lit/ds/symlink/sn74bct2425.pdf I haven't seen it on my IIcx, or any other TI IC for that matter. But NuBus on 68000 sounds cool as hell! Forgive my ignorance, JT... is the small card that is attached to the Radius in the first picture the Futura II LX/10bT Daughtercard? Was that an option or were the two married from the get-go? I dunno, man. Pretty sure it'll either work or it won't. To the best of my knowledge, the nubus controller is transparent to the processor. Meaning, AFAIK, there's no specific configuration done by the ROM/software of the controller. It just expects cards and whatnot to be at certain locations in the address space. Nothing ignorant about that question at all in the pejorative sense (which mis-definition/misuse of the term I despise) it's confusing. I started this topic at the Beta Config stage and merely threw a picture of my "Alpha Setup" in with the pics of Gamma Config. The PDS NIC is only in there as a visualization tool for myself in developing the plexi monster proto-card in the Gamma pics. The two cards are not connected, upper card being a Radius Pivot NuBus. 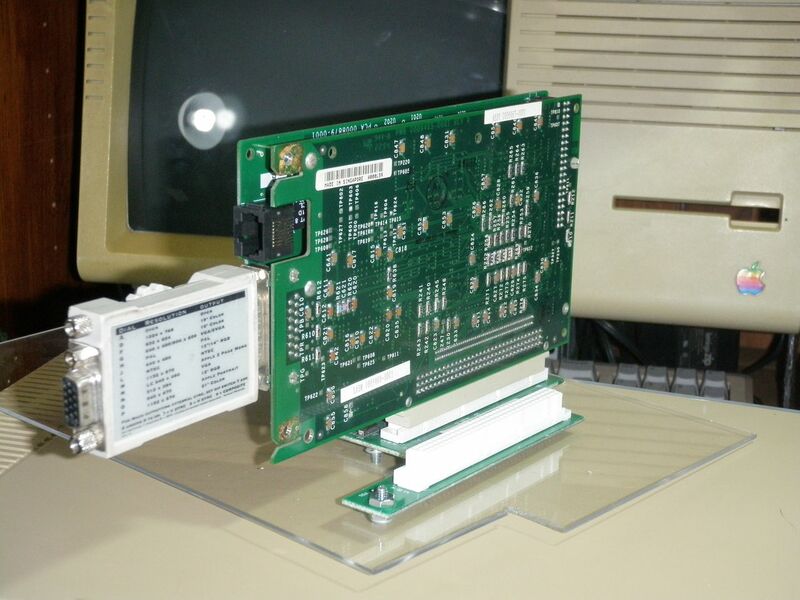 The plexi monster is a combination of a vertically extended rendition of the max-size /30 PDS card spec modified to more closely match the cutout of the NIC's tuschie as opposed to Apples stepped cutout the DCaDftMF spec. 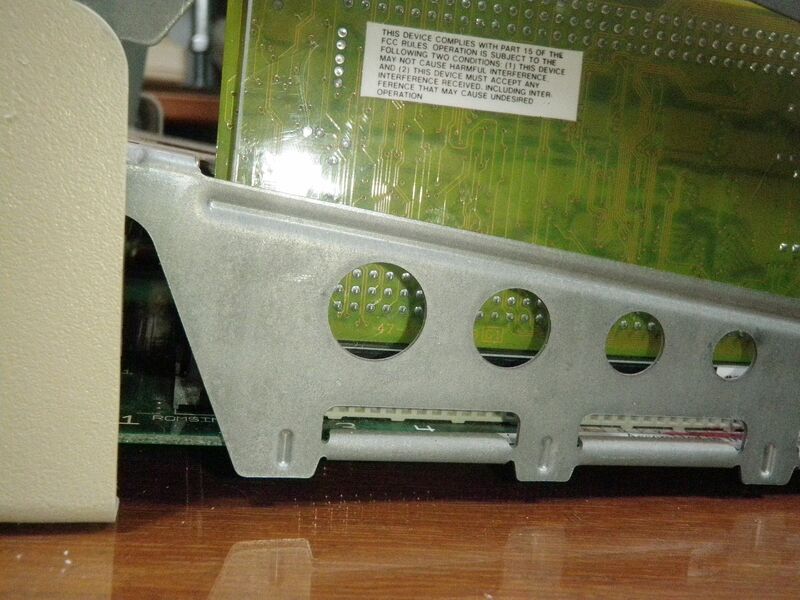 That's a breakout panel cover plate I got in an eBay assortment lot with the NuBus Radius Pivot card bolted up to it. Plate's for an SE/SE30/IIsi PDS Pivot Card's DA-19 connector, dunno which, probably IIsi, maybe IIsi version that might be /30 compatible. Haven't researched the Pivot's card/connector timeline. IIRC, I never got around to finishing that up past the fit and almost finish stage. The pie hole is indeed enlarged and offset so as to preserve the drool cup/smirk side untouched for obvious cosmetic considerations and the fact that I had/have big plans for the subsurface flat(s) above (and maybe below) the FDD slot. 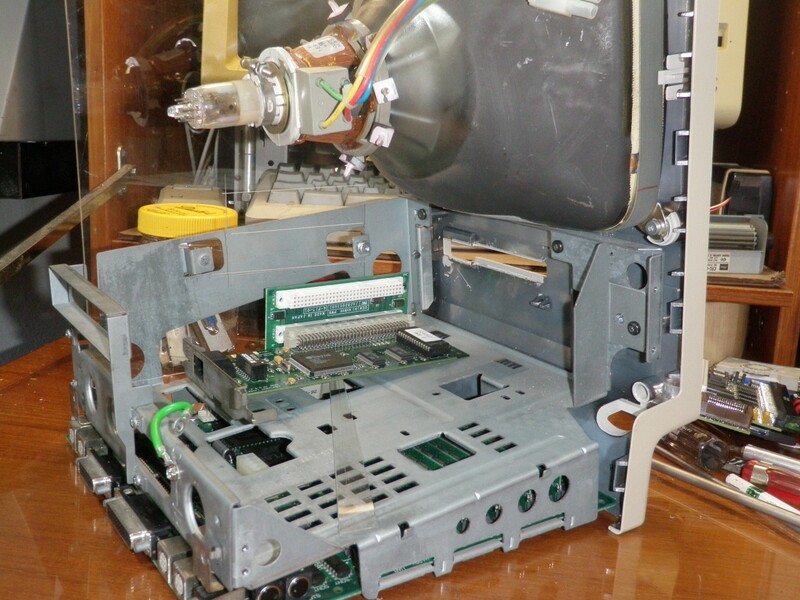 I had taken that one over the top, it's an internal modification of an external Zip, because I wanted to and also because the SCSI internal variety is rather rare and pricey. 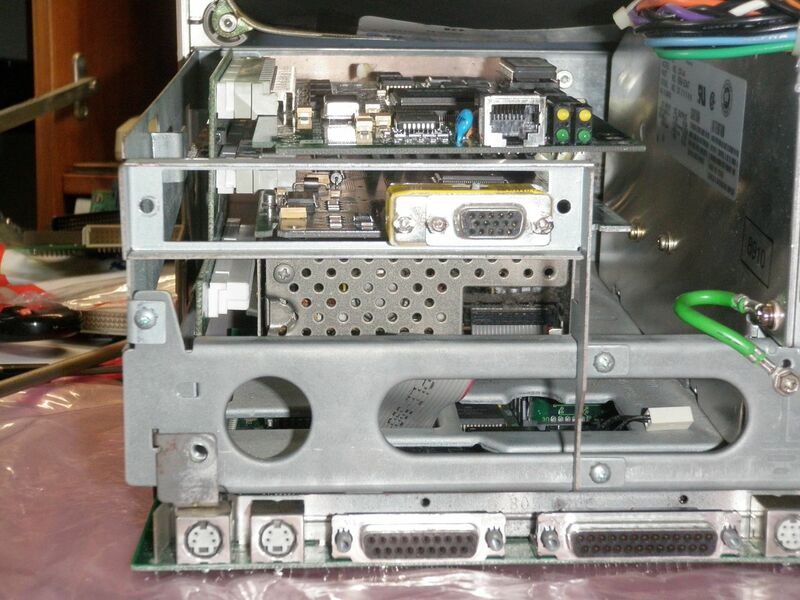 Injection/ejection worked a treat, but when I took a break from the finishing stages, the hack was hijacked by the ATOMicZipMacPLUS/MacQuarium™ project where a slightly different cased parallel port Zip250 external drive would have been similarly modified. I think I'll re-post that and other hack threads here (time and attention deficit allowing) to restore pics and clarify my apparently indecipherable terminological abuse. N.B. the clear "bucket" illustration is from the MacintoshClassicIIIColorTVp™ Hack and I'll edit in that explanation for clarity. edit: it's jt, not JT, that'd be Carly Simon's (drool) ex. the handyman. 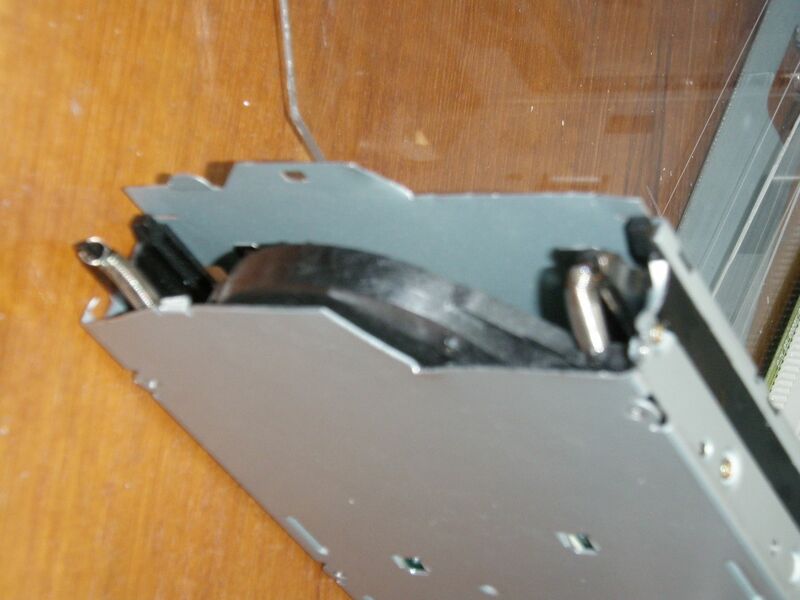 Side order of chopped External SCSI Zip Drive bits, internal SCSI Zip drive fitting process in evidence. I'm leaning toward keeping the stock FDD Cage and filing away a bit more at the top of the slot. Now that I've rearranged the components a bit, I don't think I'll need that tiny bit of clearance to be had by replacing it. PlexiMonster over MaxSpec/30 Card Drawing with DuoDock Gemini Twin Slot Lowser (as opposed to riser) Card. The ZipMacPlus™ cutaway bucket is shoved on there as far as it can go without modification to protect the /30 MoBo and provide access to the innards. The inner plexi chassis from the tangentially related TVp hack will not again be installed, it gets in the way of the card installation hard points. PlexiMonster over High Voltage Joltage Emitter. 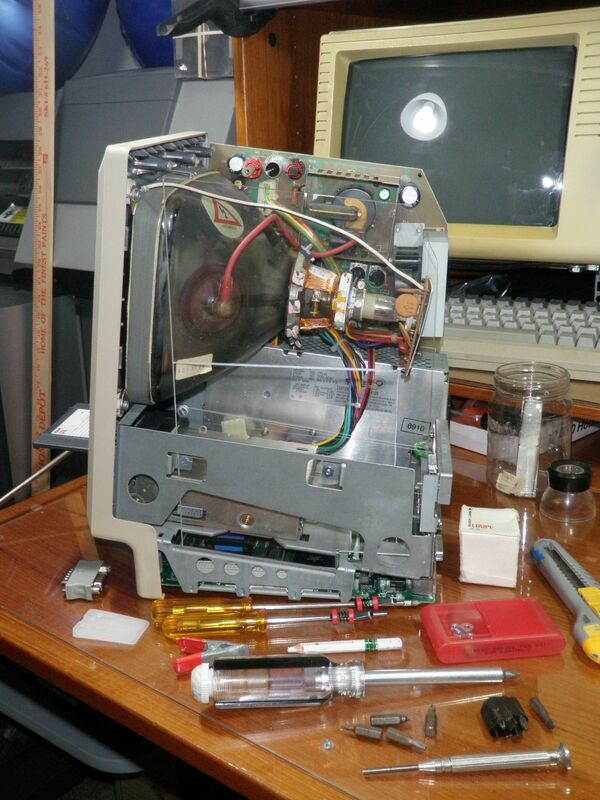 No Gemini Card installed, white grease pencil approximates what Apple decided was enough PCB acreage for the SE & /30. Now that I'm on the NuChip track, I won't be using this adapter or the planned parts. Following the well documented Macintosh II/IIx/IIcx NuChip/stock transceiver part array implementation instead of trying to reverse engineer the NuChi30 or NuChip34/TI ASIC transceiver implementations should simplify board development a good bit . . . or not. Note Tic-Tac(?) parts tray. I love bbraun's high tech dad's numerically enhanced egg carton project parts organizer, but I'm more the bull in the China Shop sort. Imagine a Charles Schultz drawing of Pig Pen as a teenager trailing a cloud of digital detritus, case parts, hardware, fasteners and assorted sheet metal bits . . . then add about 50 years. LOL! I entirely missed your feedback until now, bbraun. Thanks, I was already working on the monstrosity I posted a while later when you replied. That kind of behavior is what I guessed per our previous correspondence, but it's great to have your input to back up that WAG. NuChip was lookin' really good, most all the signals seemed to be familiar from the IIsi PDS. But then I spotted a problem, three of NuChips lines are tied directly to VIA2 and seven of them tie directly to the PMMU. Looks like the NuChip30/TI Transceivers that work on the IIsi PDS or NuChip34 with same that work on the Duo's '030 PDS Docking Connector may be the way to go after all. Never look at schematics in the middle of the night. I never thought about patching those ten connections to a cable I can plug into my PDS card. That would be the same sort of workaround ddenowh did for the MacGusto card needed to expand upon the I/O available on the ROM sockets. What kills me is that it's the exact same method I was using for the kluge I'd been developing for bringing Bank A of the IIsi up to its full potential*** before I blew the poor thing up by turning it on with a crapload of expansion cards with a probe clip attached to the memory controller no less. It's cool, you should see the pretty RAM dumped onto the screen it flashes before laying there deader-n-lox. As I got out of bed this morning, after not getting to sleep immediately upon hitting the rack as usual, this workaround hit me like a rubber mallet, go figure. I didn't feel like cracking the books or looking at schematics today, so I decided to give that a rest. Had some time to carve out for relaxation so I reverted to form. I don't know if it's an example of the ultimate in CompactCorrect MoBo upgrades of a Mac Plus or the most deconstructive of /30 hacks, but the fallback plan is the ZipMacPlus/30/10bt/Pivot(R) and I had a bunch of fun tearing up the backside of the Plus Bexel and hacking the living crap outta one of my many extra IDE Zip100s. Frankly, I don't give a rat's @$$ what anyone else thinks it was a lot of fun and I like it! I deep-sixed the /30's FDD chassis as well as the FDD & HDD so I could lower the Zip a bit to avoid overly modifying the existing Zip Slottage. 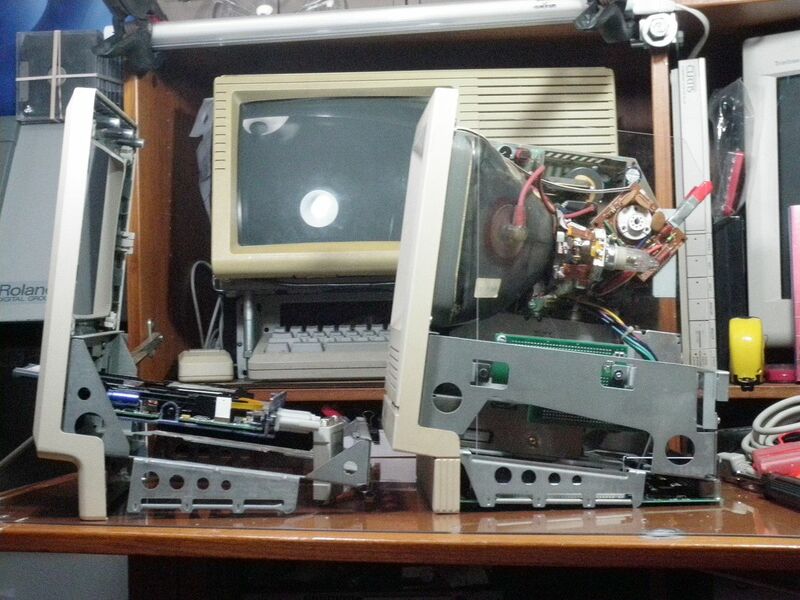 The whole thing is totally non-destructive from the /30's end of things, drives, brackets-n-bezel will be stored away. The MoBo was DOA to begin with, so there's no worry there and I have a fried SCSI Zip to transplant into its mangled IDE cousin's chassis. This is a design exercise unless I bring this project board back to life at some point. I think I have enough M->F breadboard header wires to make up the PDS extension/offset cable on hand. If not, olePigeon is sending me ten 96pin extension cable toys anyway. PlexiMonster's spawn is taking shape, I need to change the name to something like PlexiGlasAtrocity(R) or something equally objectionable! Lots of room for the cards under the Zip and an HDD cage above, Accelerator goes on top of the finished KlugeCard. 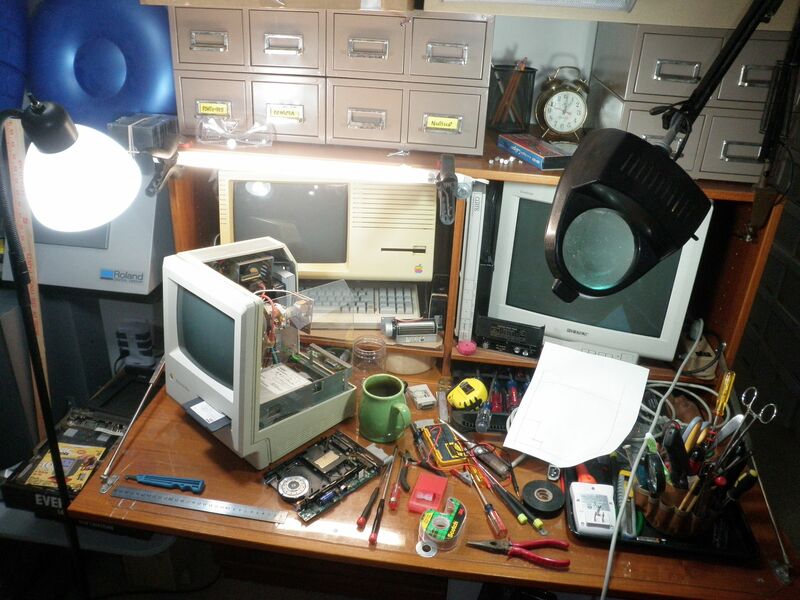 Thanks to uni, I found the PDS in the SE/30 schematic and some very interesting things. One thing popped right out, the NuBus signal is present in the schematic. It's at C2 in the IIsi PDS, other places I've seen C2 as n.c. a/0 reserved, IIRC. Now, in DCaDftMFH, I see it documented as an either/or case in the generic 68030 PDS. It's N.C in the IIfx and connected, but active during accesses to the built in Video of the SE/30 with a couple of caveats noted. Methinks these will further shed light upon the conversion necessary to make the SE/30 PDS IIci Cache Card compatible! Enough playtime for now, I don't feel like transcribing the data on p. 460, too tired. Quick snooze: still tired, but realized that's p.460 in GttMFH2e, DCaDftMFH doesn't even go that high. I'm back in business, the replacement for IIsi board I electrocuted arrived on Christmas Eve! Project is rebooted, the Apple Transceiver/NuChip30 approach came out on top. Depopulation of one of my IIsi NuBus adapters = active components for the prototype and a bare board for buzzing the connections. Elimination of extraneous complications introduced by the CoPro will be useful, not to mention yielding a 68881 for a socketed expansion board. Alpha Unit development/testing procedure of Project_30's protoboard on the NuBus friendly IIsi seems to be a no-brainer after all. Adaptation to the /30 comes afterward, my /30 board remains DOA anyway. edit: TI Transceiver/NuChip34 will be the first adaptation, I've got way more DuoDock(1) boards than IIsi adapters. OMFG! Even I can't really follow this drivel after a year . . .
Activity over yonder on the RCPII/IIsi Hack front got me to crack the case of the X/30 and look for the project box. Found some of it to get started again. I went on hiatus for several months not long after the last post I made here. Being away from the silliness of my hacks has probably been good for me. Getting away from the forums and back into real life for a while helped too . . . if you can call online dating "real life" that is. It's more surreal than reality TV from what I can tell, given the tiny bit of that I've experienced. Getting new meds for the mixed episode I've unknowingly been suffering from for the past few months helped a lot. I'd never heard of such a thing. Finally getting a roommate to alleviate the money woes at about the same time didn't hurt a bit either. Lookin' to get back to somewhere in the general vicinity of the track . . . Project30 was pretty much a derailed train wreck from the get go. Has anyone got one of these cards or a pic of one? 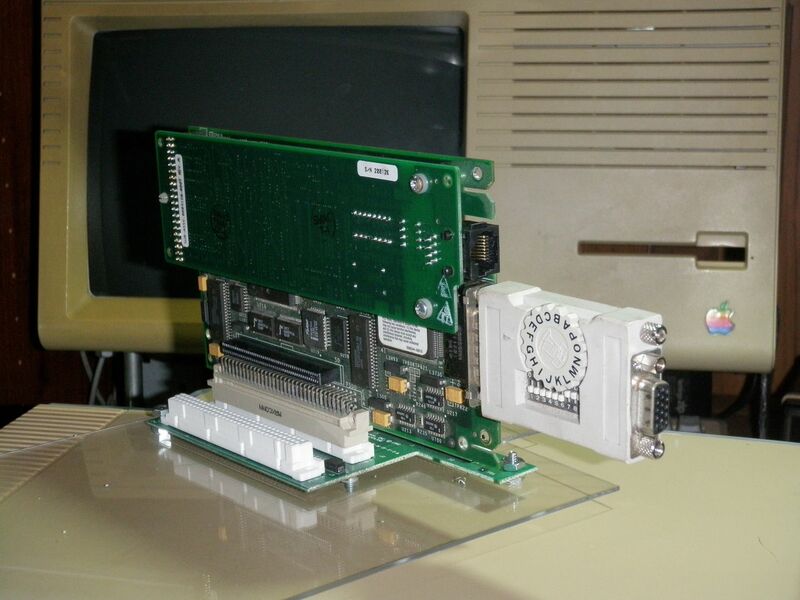 The NuBus implementation's chipset and connector squeezed onto an accelerator adapter card makes me incredibly curious. My Cheap@$$ SMT re-work/soldering station just arrived. I figure ANYTHING has to be better than the high/low setting RadioShack iron I've been using in my feeble attempts at soldering. This heat gun will hopefully be better than the real one or the plastic soldering gun I was planning to use on (destroy) PCBs. Hey, uni! What was that Cheap@$$ Hakko vacuum desoldering knockoff? If I'm only doing a few PDS connector refits and re-caps, might it be a workable solution for casual use by a pauper? I use my Hakko 808 about 200x more than I do my Ayoue hot air station.